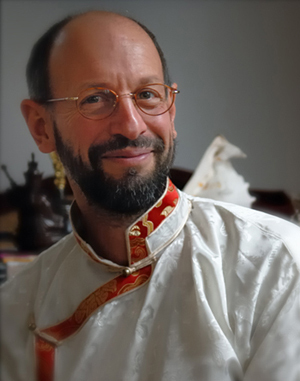 Lama Mark Webber (Lama Yongdu Chokyi Gyaltsen) has been studying and teaching Buddha Dharma (the teachings of Liberation through the traditions of Buddhism) for thirty-eight years. He was born in 1956 in Toronto and started practicing meditation at the age of 16, through a strong interest to understand consciousness by using the mind to study the mind. In the following year, he began to formally study Buddha Dharma and meditation with his first teachers Karma Chorpel Dolma (Beatrice Raff) and Lama Karma Thinley Rinpoche (who introduced him to the Karma-paksi Guru Yoga and Extraordinary Foundation Practices). He met his root teacher the Venerable K. T. Dorje Namgyal Rinpoche in 1974. Namgyal Rinpoche was an extraordinarily great meditation master and a superb Dharma teacher who was a precious mentor to Lama Mark as well as many other humans and non-humans alike. Lama Mark has completed extensive meditation retreats and periods of study, including the three years of Teacher’s Training given by his Root Teacher between 1975 and 1977. He has also studied with many other outstanding teachers from Eastern traditions including H. H. the 16th Karmapa, H. E. Chogye Trinchen Rinpoche, and currently with Drikung Lho Ontul Rinpoche, (given with Refuge the name, Lama Yongdu Chokyi Gyaltsen). During the 1980’s Lama Mark was a Resident Teacher during Namgyal Rinpoche’s seminary program at the Dharma Centre of Canada called The Academy. The title “Lama” was bestowed by H. E. Chogye Trinchen Rinpoche in 2001 with the name Lama Karma Tenpa Lekshe Yongdu, and in 2002 Namgyal Rinpoche gave authorization for Lama Mark to bestow Empowerments (wong-kur) in the Vajrayana Tantric tradition. Lama Mark also attended Namgyal Rinpoche’s final Teacher’s Training at the Dharma Centre of Canada in 2003.